The day ended with an impressive display of helicopter flying in the clubhouse. The gathered crowd were speechless as Jane flew Glyn's helicopter around for what seemed like an eternity with no incidents or accidents. The two helicopter pilots then bonded over discussions about 2.4ghz spectrums and spare undercarriages. Another gloriously sunny day, we are about to open the hangar and go flying. Come and join us, the views over the snowy Chilterns are amazing. 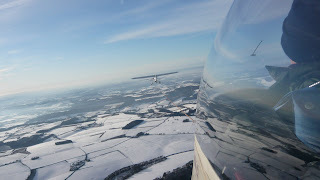 Two days of glorious flying off the snow this weekend with club members turning out and keeping current. Here are a couple more photos of the snow at Booker on Saturday. Lots of club members out with cameras so hopefully a few more will appear on the web site. After half an hour or so defrosting the hangar doors, Will and Doug Hilton took first flight of the day with Mike Collett tugging in MF. William P kindly took me for a flight in the back of K13 EBZ. On tow towards the Hambleden valley behind Cub MF. 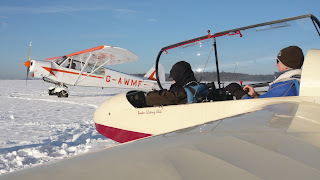 Following this morning's lecture on thermalling (probably wrong sort of thermals for this time of year), we've been having fun doing aerotows from the snowy airfield. Cold but great fun! 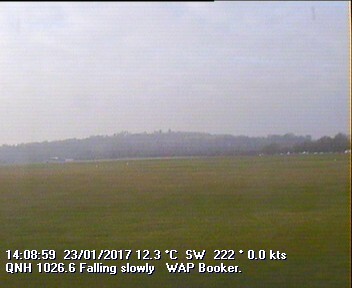 This image captured from the BAFC webcam. 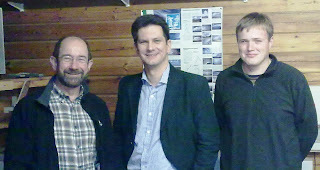 On Friday the Club received a visit from Steve Rodrick, Chief Officer for the Chilterns Conservation Board . He was interested in how the Club operated and its achievments. 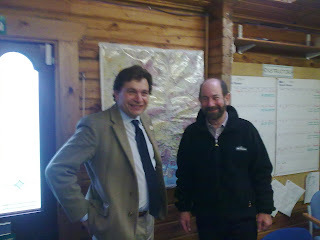 He also talked to Geoff about the aims and objectives of the CCB. Steve last flew in a T21 many years ago. He said he will come back to do some flying with us in the near future. Well above them actually. Today we were fortunate to see some lovely flying conditions, with nice gaps in the clouds for those who wanted to fly higher. There's something very special about flying along and seeing the glider's shadow projected onto the side of a cloud. Even more unusual was the rainbow that encircled the shadow. Very picturesque and just about captured in this photo. If any of you noticed that a few of us were missing yesterday, be of good cheer! We had hoped the weather would be bad but it turned out better than expected. Nevertheless, the committee were joined yesterday by a group of enthusiastic members, to work on the club's strategic plans for 2010 to 2014 and beyond. We invited a cross section of proactive members, from early solo to long standing veterans, on a fairly arbitrary basis, to get good representation. The response was terrific. Please accept our apologies if you would have liked to participate in such an event but were not invited. We did chose somewhat at random and it is no reflection on those whom we were unable to invite, simply because of the venue's necessarily limited capacity for numbers and the manageability of the group size for an effective workshop. 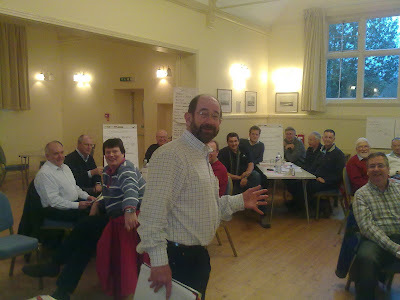 We had twenty four members in total who gave up a whole day to attend the workshop which was held at Goring Heath Parish Hall. There was a little bit of wingeing about the early start prior to the event but everyone got there and got really engaged in the topic. It was an intense day and I am sure everyone felt exhausted at the end of it, but we made good progress in plotting scenarios, and identifying issues and opportunities for us to work on. 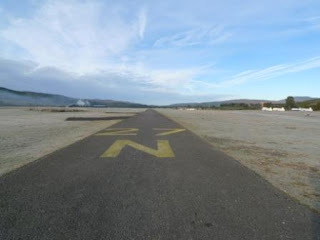 Rumours continue to abound about the likely future of the airfield, most of which are untrue, even when seeming to come from authoritive sources. The committee, and those who have been assisting with the club's affairs, were able to give clarity on the club's situation. There is uncertainty about how the airfield may look in the future and the extent to which the council may or may not develop it. But we will emerge stonger, whatever happens, either with a stronger tenure on a much reduced airfield development than that muted or be handsomely compensated for being willing to move our operation to an alternative site. Either way we believe we will be better off and that we have something to shoot for that is very exciting. Plotting our activities and focus certainly occupied a winter's day when we did not miss too much in the way of flying. We were spurred on by the knowledge that we have a great club with some very talented people who are capable of tackling whatever lies ahead. In the immediate future, we are looking for someone in the club who may be a professional PR person, or someone who aspires to such, to help us with a communications programme. If anyone fits the bill we'd really like to talk to you. Sadly Dudley Steynor our oldest member passed away peacefully in his sleep early on Friday morning surrounded by his family. He had celebrated his centenary in October. It was a grand affair, with an air display, steam engine, a Lagonda, and other vintage cars. A more detailed tribute to Dudley will follow. Our thoughts are with his family and friends. The weather precluded any flying so we look forward to Steve's return when it improves. ....... the calm between the storms. A very pleasant afternoon once the morning's rain had passed. A stiff southwesterly, but blue sky, 3000ft cloudbase, there were even thermals. Only 3 flights, but well worth the effort. Thanks to Pete and Bob D for turning out to get Mike and me off the ground. The day started with a 10kt south westerly with 2/8 octas at 11.00. It steadily improved and by 13.00 we had 4/8, 3000ft and 3kts – superb. The middle of the afternoon saw the wind freshen just enough to make it interesting – 15 gusting 20 straight down the run, a bit bumpy but not rough. The airfield which was a little damp dried out but we still took care not to spin the gliders on the spot when ground handling so as not to dig holes. The flying diary was fairly busy and it was fortunate Glen Alison was on hand to ably assist with the instructing. With the unsettled weather we’ve had since the start of November several pilots were suffering severe withdrawal symptoms. 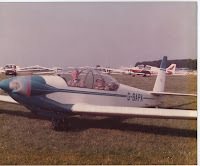 John Turner and Richard Harris flew 314, Richard Clark was in DJK, Richard Martin KCZ, Gary Sparks, Steve Lawther and John McCollough were abintio training, Simon Phelps instructor training and Eric McLeod and Graham Morfey had check flights. 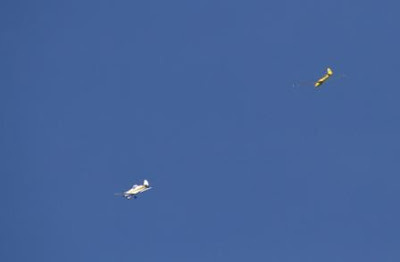 An excellent November soaring day was had by all. Unfortunately two cadets had to leave before the photoshoot, but here is rest of the 2009 cadet team in all its glory. Great use made of the clubhouse today with the annual end of season cadet meeting. Fanastic support with all of the cadets turning out promptly for a 10:30 start! After the meeting, most cadets also brought their parents along for the buffet lunch; well someone had to bring the food. It was another fine day on the airfield with plenty of the usual training from ab initio through to instructor training. 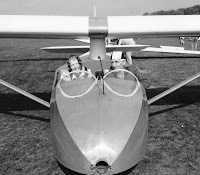 Even Discus WD took a launch and Anne managed longest flight of the day with a 59 minute soaring flight. A beautiful start to the day with fabulous visibility and a light westerly breeze. 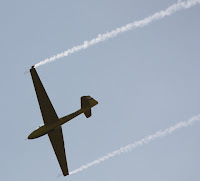 It was thermic around midday with a 3,000' cloudbase but plenty of breaks to allow Graham Saw's aerobatic course to make the most of their 4,000' tows. In excess of 40 launches for the day made for a good 'un. For those on the ground the entertainment was laid on with a "Strictly Pawnee Starting" competition. And the judges verdict is in..... Heggie 0, Collett 1. Well, I did go to the ridge. It was 268 to 280 from 16 to 20kts so not great. Spent 90 mins at 900ft working out how to get back then happened into a bit of rising air and took three s turns to 1300ft and home. A good exercise in patience and ridge confidence. J1M has taken a tow to the ridge and confirms it's working at 1200'. Meanwhile it's trial flights and instructor training at the airfield. Just had to be done...ridge tomorrow? Paul Goodman Conservative MP for Wycombe and Shadow Minister for Communities and Local Government visited the club today. 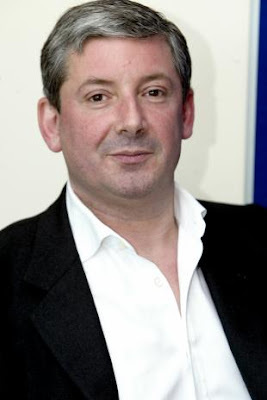 He had talks with the chairman Geoff Tabbner and deputy chairman Denis Campbell on a variety of issues. Many thanks to Geoff Lyons for arranging the visit. After a couple of false starts due to poor weather we flew a couple of groups funded under the government's "Learning Revolution". Twenty clubs have each been granted £1000 from the BGA to fly those who would never otherwise have had contact with gliding. They all immensely enjoyed the experience and were very grateful for the opportunity. The photos shows the very happy group from the "rethink" charity in Maidenhead after their flights, who would like to thank Booker for this very enjoyable and unexpected opportunity. Drove down to Parham thinking that the wind would not be strong enough but flew nevertheless. Had 2 1/2 hrs soaring and did about 200k up and down from Harting to Lewes in N'ly varying between 11 and 14kts. Was plenty good enough for the easier bits. Met up with Ben (2A) and Jon (T6) for a bit of high speed 'hooning' (Jon's word) up Ditchling Beacon. Great fun. A compilation of video clips from week 2 2009, with shots from a typical wave flight at Aboyne. Quality of flying shots has suffered in an effort to reduce the file size from the HD original. After enough rain to encourage Noah to build another Ark the sun decided to show its face! 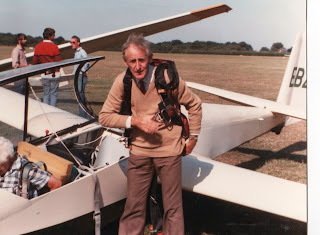 Dudley Steynor who instructed at the Gliding Club for 30 years, celebrated his 100th birthday today in grand style at the Grouse and Ale Lane End. 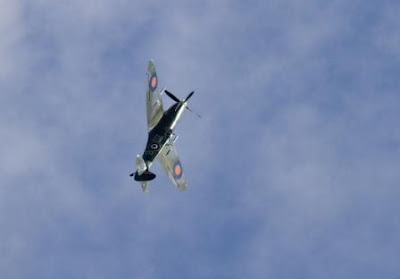 With a Tiger Moth Fly past and aerobatic displays by Graham Saw in the Lunak and Al Kay in the Spitfire. The weather has not been kind this week, the entertainment has been confined to model flying and a trip in Glyn's Robin. Rumour has it that on Thursday our brave boys took a look at the sky and went to the Royal Lochnagar whisky distillery. While they were there the cold front went through and when they arrived back at the airfield at 4pm they found everyone else was at 10,000ft in classic wave. There's a lesson there somewhere. The day at Booker was slow to get started but after 1pm it started with 3kt climbs to 3000ft above site. Tim Z3 and I set off on a 170k AAT which took us to Silverstone and Goring. 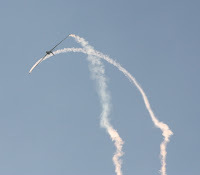 AJ, A9, and 314 also flew a task. Cloudbase eventually reached 3600ft or so and the task was completed, for a change, at 88kph. For the middle of October....excellent day out. Fish pie. Chocolate Almond cake was good however texture was a little floaty........ Sorry I thought i'd continue on the theme of the last two weeks. Now that all the gormets have gone home it's Chinese in the clubhouse. Full report to follow! Friday was wet and the entertainment consisted mainly of food, as can be imagined. Saturday started a bit damp, no wind, so after a bit of tea drinking Bob got his little yellow Cub out and let Chairman Geoff try his hand at flying. 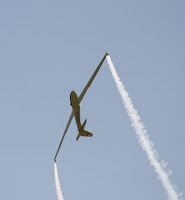 This all went fine for a while until P1 failed to take over and the Cub headed straight for the ground, vertically. A small party went back to Clearfield for lunch and then cleared the table for aircraft repairs, propping up the wing to get the dihedral using olive oil jars. The broken propeller made two handy spatulas for the epoxy. We then went for a walk round the hill, on the way meeting the Laird who was inspecting his estate. There was time for a quick test flight before dinner at the Boat again. A pleaseant afternoon but no wind, not even much in the way of thermals from the look of the sky. Today the forecast wind profile looks good - wind increasing with height, and from the NW - but down the valley it looks a bit wet. Some of us are trying to decide whether to hitch up and leave now or wait a little and see if there is a chance of one last wave flight. Week 3 begins today, with luck we will get reports of their exploits. Glyn G1 - Marr Lodge, "only 10,000ft on the way, I stopped at Balmoral on the way back to warm up"
Julian ECZ - "I went up the valley somewhere, I don't know where"
After the big toys were put away, the small ones came out and Glyn and John flew Glyn's Funjet while Rob tried to avoid it with Bob's little Cub. 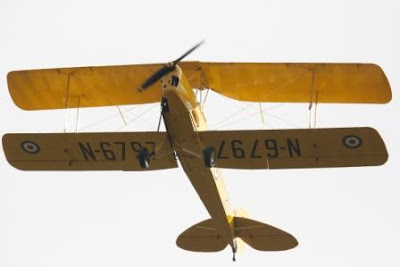 Jane found her flying skill improved by a glass of Glenlivet. And then off to dinner in the Boat in Aboyne, another excellent meal, the butternut squash and pistachio risotto is particularly good, and there were compliments for the steak pie. This time the desserts were tried and seemed to go down well. The oatcakes with the cheese platter were excellent. Today is wet and not going to improve, so we are forming plans which will no doubt involve tea shops. Rob, Rolf and Craig have left for the south. Craig has had his eyes opened to the possibilities of gliding and the special nature of wave soaring, and will be back next year. Good soaring at Booker today, Streeting in light N'ly with 3kt climbs to 3600ft above site. Gammon with new potatoes and veg tonight. In at no. 4 is Chocolate, Rum and Orange. Cheesecake still at no. 1 with Chocolate Log and Chocolate and Almond joint second. Barry JDV, John JH, Rob RM and Rolf 318 also flew but they've obviously got dinner plans so we have no report of their exploits. Shelagh just wanted everyone to know that the weather here is rubbish and she's just had a cup-a-soup. Monday dawned bright and clear with a hard frost, very pretty but very cold. We rigged ECZ and did a bit of fettling and cleaning, then Craig and Dave set off to see if anything was stirring. There was some weak wave and thermal which kept them up for an hour. Glyn G1 and Rob RM also took launches to check various bits of kit. 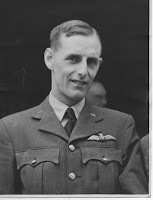 While airborne they reported a house fire 'just over the hill behind the airfield' which had those of us staying in isolated houses of that description some anxiety, but it proved to be the farm buildings of an unfortunate farmer. After a pause for lunch (leek and potato soup, since you ask), Geoff and William went to walk round Loch Muick, 318 was given a polish and Craig had another circuit, then we packed the toys away and got the models out. It rained in the night and is still a bit damp, but the sky is clearing, so maybe there will be some fun later. A number of firsts for Craig - wave flight, cross country, Duo Discus - and he can now see why we drive all the way up here every year. And Chris with a gold height. Drinks on them then. And for the food critics amongst our readers, yesterday 0ne party went to Spey Bay on the Moray Firth, where they struggled to walk in the howling gale along the pebbly beach. No wildlife to be seen, the seals and dolphins were sensibly keeping their heads down. The visitor centre has a cafe with excellent scones of all flavours, plus a warming soup. The other party set off for a walk round Loch Muick but after a while decided that it wasn't that much fun in the strong wind. Dinner at the Boat in Aboyne where the venison is recommended. On Friday the wind was easterly and a bit damp, and so a day for model flying. Bob S had arrived and brought with him his little yellow Cub with the box for him to take over when it all goes horribly wrong. Jeremy and Richard displayed hidden talents, Jane less so. Glyn then flew his fun jet, and then handed it over to Mike who made it look even more fun. In the afternoon six of us went for a scramble up Burn O'Vat, managing not to break any ankles. Craig, William and Dave B also arrived, Roland and Jeremy left. Dinner, just for the record, was fish and chips from the Ballater chippy, and very nice too. Today it is blowing a gale, walking across the car park is a bit of a challenge, so we are planning other entertainment until the wind abates. Well done Jim on the height gain, you should come up here and try some proper wave, the views are better. So as not to be left out, rigged and launched today at Booker. Contacted wave at 1200ft just west of the airfield and took 3kts to 2200!! Otherwise a local soar. Chicken Jalfrezi last night was excellent. Possibility of ridge tomorrow??? Glad to hear you are having fun in Aboyne. Apologies to those I've forgotten. Oh, and by the way, the steak and chips went down very well (another triumph for Jim), and so did the whisky afterwards, apparently. Just to show that we still know how to beat gravity without the luxury of wave AJ and 918 had a go around Northampton South and Edgehill. A great day for October with the odd 4/5knots to 4400asl, just a tad on the short side but then the Autumn equinox is only 19 days away. I just had to get another cross country in this year so I could make the total up to 10,000k. for the year. Perhaps there will be another day before I put the old girl away. Wednesday's flying was in two shifts, those that launched early (Jim 208 for example) got up and away, some of the others spent a while practising thermalling before eventually getting into the wave. The second shift, at around 1730, found themselves at 11000ft in no time, magic. Meanwhile Denis was off on a 500 to Callander-Rhinie-Killin, and Glyn did Manchester out and return, reaching 23000ft, but in airspace so it doesn't count. And now off for steak and chips (Jim again).